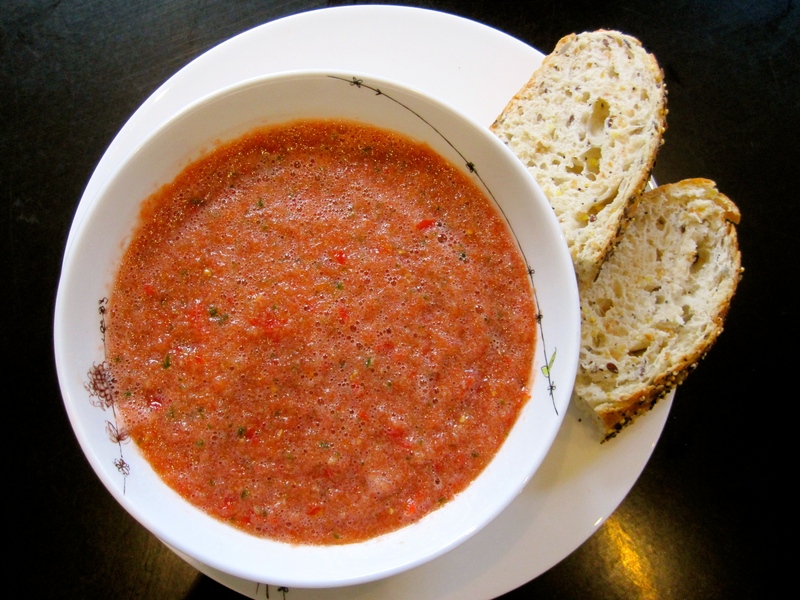 I love experimenting with soup and was excited to try the Watermelon Gazpacho from Green Kitchen Stories. It was a relatively warm summer day in Antwerp and a cold soup sounded refreshing. Although the soup tasted delicious, it was a bit much as a main course. I think it would be better as a starter – strained and served in drinking glasses for a party, perhaps with a shot of vodka. This dish came about by accident. Originally I wanted to make Green Kitchen Stories’ Involtini di Melanzane, or rolled stuffed eggplant, because I had tomato sauce left over from a couple of nights before. But it turns out I am awful at slicing eggplant. You have to slice the eggplant very thinly, but mine were uneven and all but a few weren’t the entire length of the eggplant. 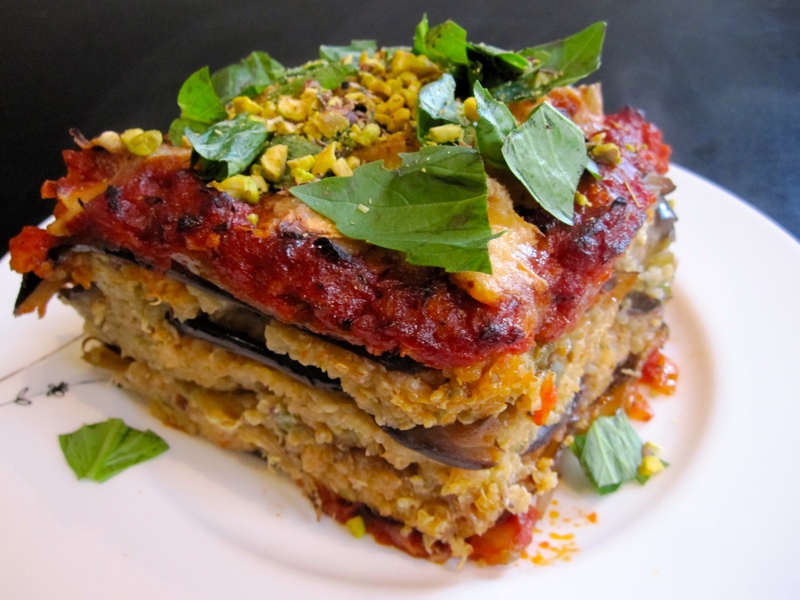 Because the eggplant needs to be grilled in the oven before rolling, I had an idea for making lasagne after seeing the slices laid out in a casserole dish. So instead of pasta, I used the eggplant slices! 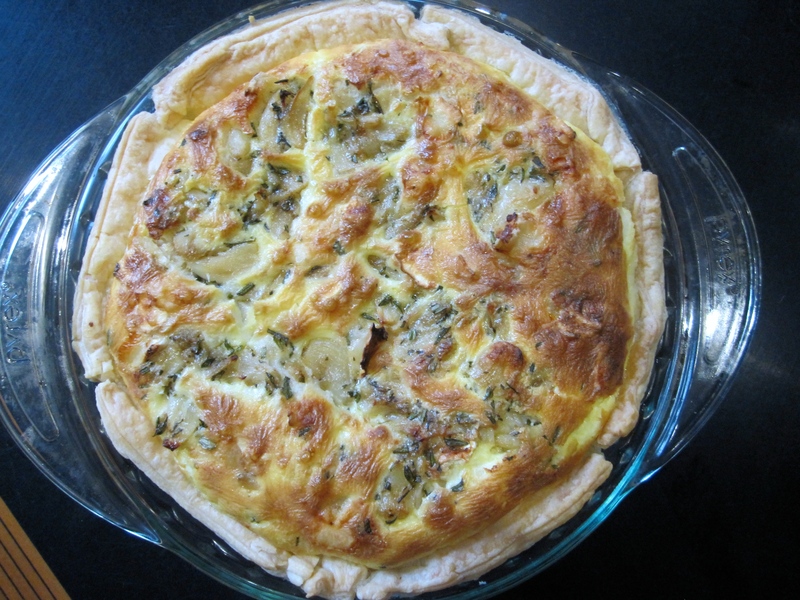 Mmm…it turned out very well! I’m a big fan of Courgetti and Zoodles, aka thinly sliced zucchini that looks like spaghetti noodles. I’ve tried courgetti with various sauces ranging from avocado to tomato, but this is the first time with mango! Mmm… The Mint & Mango Marinated Zucchini Spaghetti from Green Kitchen Stories is so delicious! I prepared the zoodles as a side dish with salmon with paired together perfectly. Can you eat it raw? Yes. 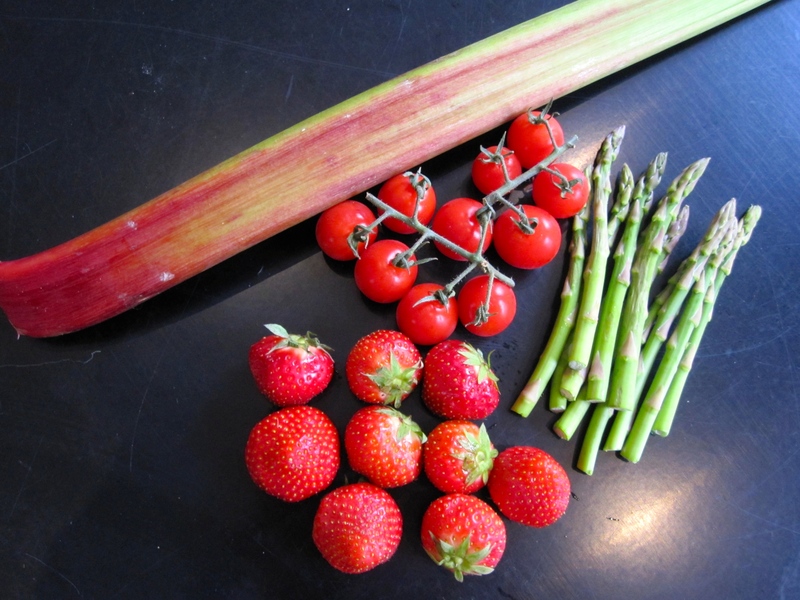 Can you eat green rhubarb? Yes, but people like the red ones for aesthetics but the taste is the same. The salad is really easy to make – just cooking the lentils and chopping the produce. What a great combination of flavors! There were no leftovers, so that’s always a great sign! For Els’s birthday this year, we celebrated in Amsterdam. 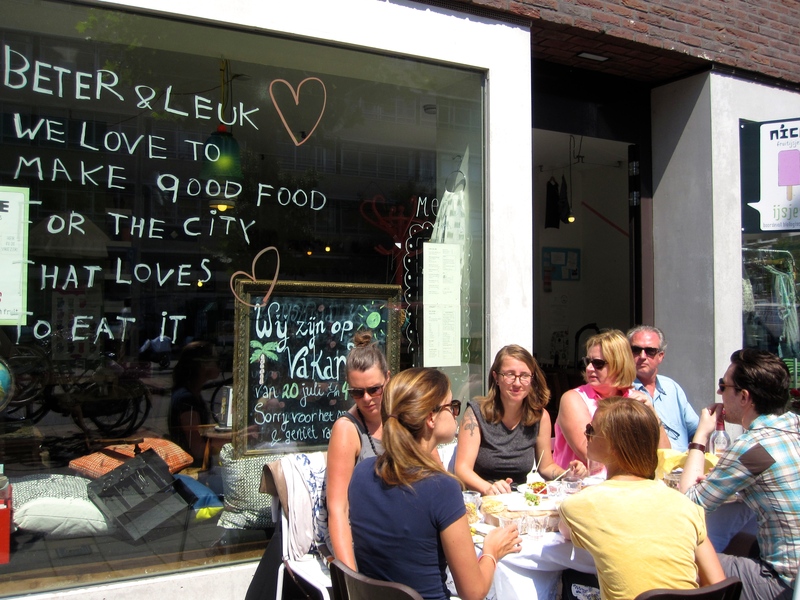 We started out at our favorite café in Amsterdam – Beter en Leuk – for a delicious and healthy lunch. Beter en Leuk just so happens to be owned by Koen’s cousin Hanneke, and you can find organic vegetarian, vegan, gluten-free, etc dishes and drinks for breakfast, brunch and lunch, as well as great cookbooks, clothing, jewelry, and other treasures! If you are in Amsterdam, Beter en Leuk is a definite must-visit! After our feast, we took Els on her first metro ride to the center of the city to Dam Square. We visited the History & Royalty: Journey In Time exhibit at De Nieuwe Kerk (New Church) where I learned a lot about the history of De Nieuwe Kerk and its relationship with the Dutch Royal Family. After the exhibit we walked a bit more through Amsterdam before heading home. What a fun day! A couple of weeks ago, Claire and I explored a bit of Brussels before class. 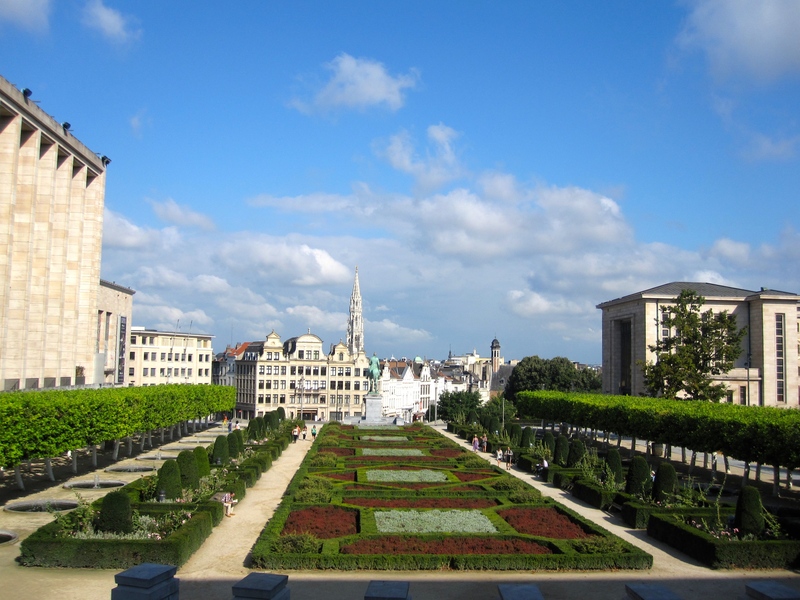 We wandered the city discovering the Mont des arts, Magritte Museum, Parc de Bruxelles, and the Royal Palace. It’s shame we couldn’t take photos inside the museum! I’m a big fan of Magritte and it was so inspiring to see the world’s largest collection of his works. Because we started with his earliest paintings, it was evident how his work evolved. Before visiting the museum, I was only familiar with his most famous paintings and signature style. But it turns out he was always experimenting. There was an entire room with paintings from his Renoir Period! If you are in Brussels, you must visit the Magritte Museum! This summer I’ve been taking classes in Brussels, so I took the opportunity to do a bit of exploring. 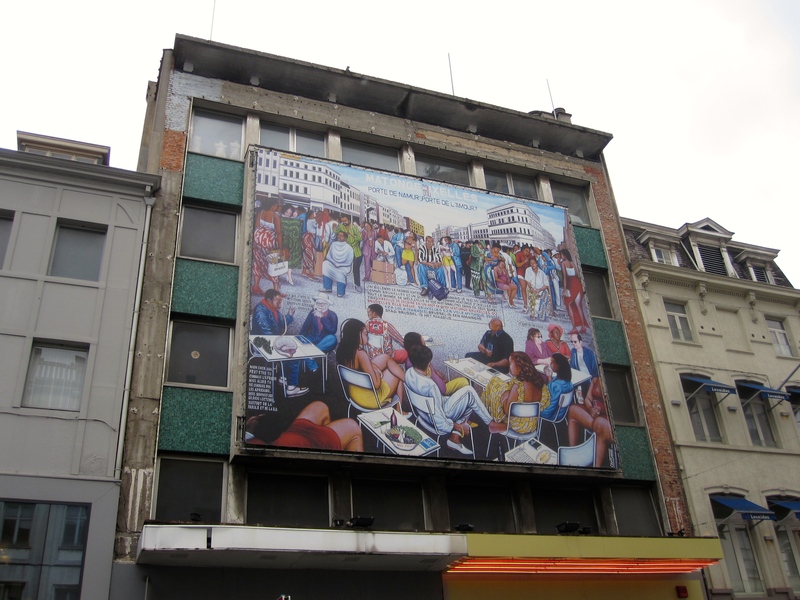 I had already been to Brussels a few times, but always to the Historic Center and other touristy places. 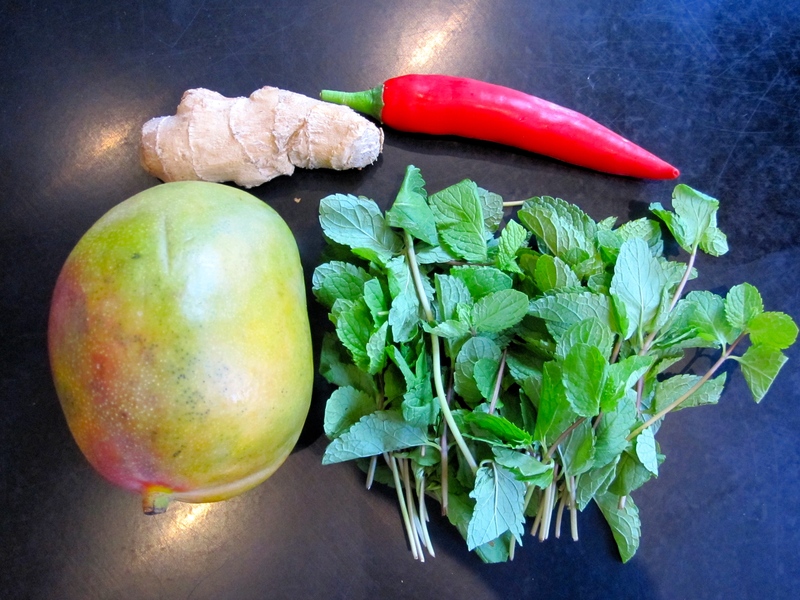 I had heard about Matongé from a colleague and was curious to check it out! Luckily a classmate, Samy, was free after class to show me around – and thought it was funny I wanted to go and take photos. I especially wanted to get plantains, okra, and habanero peppers, because they’re difficult to find in Antwerp. Fresh produce was available in abundance with little markets located throughout Matongé! I bought some Congolese food to-go to try the next day. With my plantains, okra, and peppers I made Quimbombó con Carne de Puerco y Bolitas de Plátano – okra stew with pork and plantain dumplings. It’s a Cuban dish with a heavy African influence. It’s a bit like gumbo. If you say “King Gumbo” really quickly you get the idea. Everything turned out really well except for my plantain dumplings. They didn’t stay in their form. If I make this again, I will just fry them rather than mashing them and making balls.